The finest in skin care for your body – this rich cream delivers intense, advanced moisturization and anti-aging benefits from SenePlex® Complex+. Introducing the world's finest skin care for your body---true "Beauty for the Body." SeneDerm® Advanced Hydration Body Lotion delivers the same anti-aging and moisturizing benefits to the skin on your body as SeneDerm® Anti-Aging SkinCare delivers to facial skin for a more beautiful complexion. 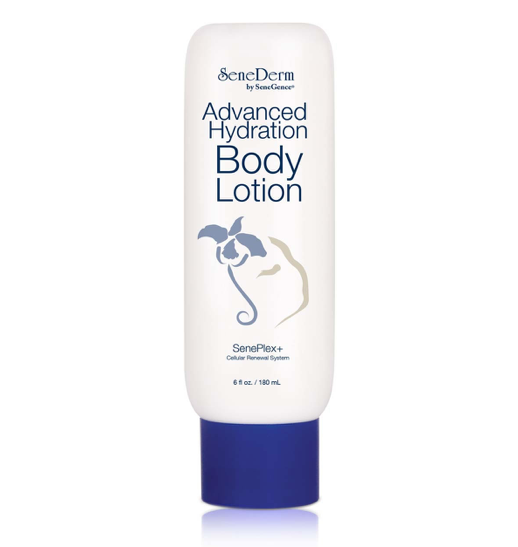 SeneDerm®Advanced Hydration Body Lotion is a rich, non-sticky cream that delivers intense, advanced moisturization and anti-aging benefits. With just a touch of a gentle scent from natural oils, this lotion firms and brings vibrancy to your body's skin, which is exposed to daily environmental stresses. SeneDerm® Advanced Hydration Body Lotion offers intense moisturization from concentrated Sodium Hyaluronate (HA), and the benefits of exotic French Plum Oil blended with SenePlex +. Additionally, this advanced formulation helps to keep the skin on the body vibrant, firm, and supple with a unique combination of natural extracts. Loaded with HA, which is a ubiquitous carbohydrate polymer that is part of the extracellular matrix, this lotion offers unparalleled moisture deliverance to the skin of the body. HA is a humectant about 100 times more effective than Glycerin. It is the key water-maintaining substance in human skin. Harsh living environments and aging can cause the decrease of HA content in skin, and as a result, the water maintaining ability of the skin is weakened causing the skin to look dry and rough. One of the main causes of skin senility is also the decrease of polysaccharides, such as HA. The special structure characteristic of HA makes it highly moisturizing and act as a water content regulator. Furthermore, its solution has high viscoelasticity and lubricity. Sodium Hyaluronate holds more water than any other molecule in the body and is necessary to keep collagen hydrated and youthful. Hyaluronate supports the structure of connective tissue by acting as a water magnet to maintain extracellular fluidity. HA forms a viscous fluid with exceptional lubricating properties necessary for the vital functions of many parts of the human body including the skin, heart valves, aqueous/ vitreous humor of the eye and synovial fluid (joint lubricant). The skin contains over 50% of the body’s HA. Considering that skin is over 70% water and renews itself more readily than most other bodily tissues, HA is absolutely vital for its structure and daily maintenance. It’s constantly involved in cellular renewal and repair because of daily exposure to solar radiation, pressure, heat, trauma and wound healing. The moisture evaporation rate constant of Sodium Hyaluronate is less than that of other moisturizers. This indicates that it possesses strong water retention properties. When HA solution is applied on the surface of skin, it can form an air permeable layer and keep the skin moist and smooth. The small molecular weight of HA can penetrate into the dermis layer, fully combine with water, promote skin blood microcirculation and nutrient absorption, and maintain normal metabolism. As a result, it plays a role in wrinkle removal and improving the health of the skin. The unique blend of natural oils in the formulation help to strengthen and maintain the integrity and firmness of skin exposed to the harshness and toxins of the atmosphere. Following bathing both morning and evening, apply to clean, slightly moist skin for best results.